Rating: 5/5 Perfect replacement December 1, 2018 This is a perfect replacement for my g’daughter’s dog-destroyed AC adapter. Rating: 5/5 Just Like New June 21, 2018 Looks like new, works like new. I have no complaints about this power adapter. Good price. The only thing I can say is I wish I didn't have to use a power adapter but that's another story. Rating: 5/5 Great replacement charger for my MacBook Air. March 30, 2018 I prefer Apple OEM products. 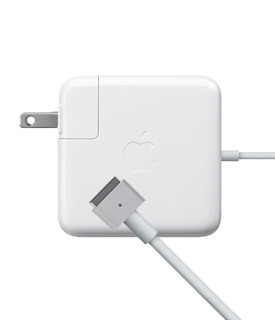 This Apple replacement power adapter performs better than the cheaper non-Apple products. I would definitely recommend checking out MacSales.com when ordering replacement parts and accessories. Rating: 5/5 Saved a lot of money March 19, 2018 When the charger went out on the wife's MacBook, I pried a new one at Apple. Ouch! Then went to OWC and bought a used one and saved a lot of $$$ The replacement is working fine. Rating: 5/5 Just right March 5, 2018 Terrific price on this replacement charger for my MacBook Air. Genuine Apple part, too. Rating: 5/5 Great item December 18, 2017 Exactly as promised: a genuine Apple charger. I have seen reviews of after-market chargers, and they generally show terrible, noisy electrical waveforms and electrically dangerous construction. Apple chargers are done right. Rating: 5/5 Bought for work and still working September 29, 2017 I bought this power adapter for work so that I didn't have to swap back and forth from home to office. Works Great. Rating: 5/5 Awesome deal September 3, 2017 Brand new MacBook charger for almost half the price. Such a great deal! Thank you! Rating: 5/5 all good July 23, 2017 I needed to replace my original charger which had a broken cable. I received this one quickly, well-packed and reasonably priced. Rating: 5/5 extra power supply June 13, 2016 Needed a second power supply to set up a station to connect my Macbook air to external monitor, etc. Best price and service from OWC, so I purchased the supply here. Received as expected, works as expected. All part of what I have come to expect from over 10 years of ordering from OWC. Quality products, quality company. Unsolicited review. Rating: 5/5 An Apple product, promptly delivered March 7, 2016 Yet again I'm impressed by OWC's ability to deliver a component to me overseas (this time UK, in the past Australia) promptly and well packaged. Rating: 5/5 Just What I needed April 13, 2015 My MagSafe 2 had shown some discoloration near the strain relief at the computer end of the cable. I didn't need any more that the Bulk Pack since I already had the adapter/extender (which I seldom use). Great to get a Genuine Apple charger at a price that works. Rating: 5/5 great August 22, 2014 It's a simple replacement but essential. The a/c adaptor works fine, and it was less expensive than going through the oem. Rating: 5/5 Great March 18, 2014 Product worked well ... much better experience than with others online. Shipped expediently and in minimal, but protective, packaging.